I have my floor. It's in a pile of boxes on my front porch, but I have it. That's especially exciting because when we were ready to purchase, I discovered that it had been discontinued. A few cartons were available spread over a 100 mile radius. I was picturing a couple of days of driving from store to store buying 1-3 cartons at a time. Then I remembered that the husband spends all week in the 'burbs. 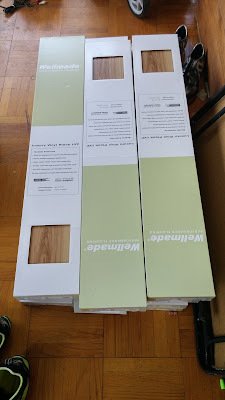 The 'burbs have LOTS of stores, and a search showed me that one of those stores had 70 cartons of my discontinued flooring. So he went and bought it. On clearance. For the win! I'm liking it. What is it? I can't tell! Real hardwood? 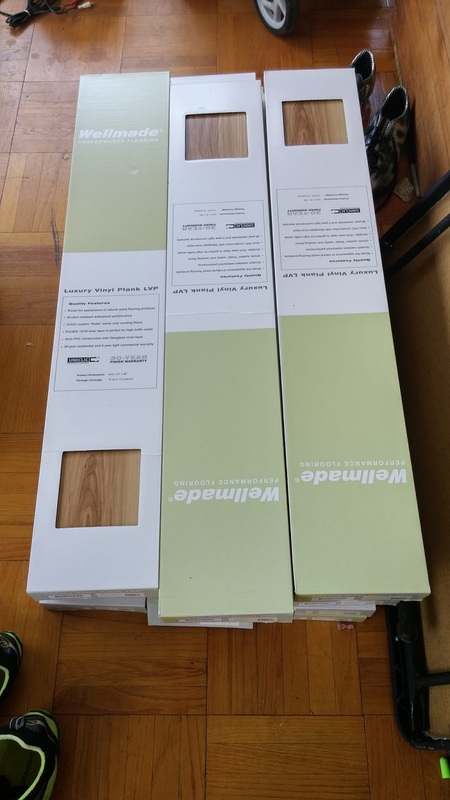 Engineered wood? Vinyl plank? I must know. Luxury vinyl plank. It is textured like wood. Click together floating-type floor. Waterproof. With a 30-year residential warranty. I love hardwood, but I am a messy kitchen person, and lower upkeep is better.